Brief Description: Scheduled Monument and Listed Building: Myddle Castle, the centre of the medieval Marcher Lordship of Myddle, is the only castle of this nationally rare type (a strongly fortified moated manorial residence built round a square courtyard) in Shropshire, though it is part of a concentration along the Welsh border. Despite being somewhat altered, the castle still retains significant archaeological remains and is particularly well documented. The site was excavated in June 1966 by Mr J Connell and pupils of Ellesmere Secondary Modern School. The aims were to draw an accurate plan of the existing walls and to discover any features then covered. 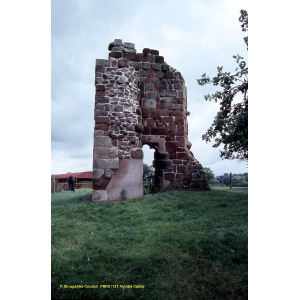 A section (A) was dug, which demonstrated that the wall from the upstanding tower continued to the S Wall. (00) Card index: Shropshire County Council SMR. Site and Monuments Record (SMR) cards. SMR record cards. SMR Card for PRN SA 01127. (01) Card index: Ordnance Survey. 1977. Ordnance Survey Record Card SJ42SE1. Ordnance Survey record cards. SJ42SE1. (02) Oblique aerial photograph: Cambridge University Collection of Air Photos (CUCAP). 1954-Jul-09. CUCAP OT37 to OT38 (2 Photos). Black and white. (03) Field Monument Warden Report: Historic Buildings and Monuments Commission (HBMC). 1983. Scheduled Monument Report on SAM 11986. (03a) Volume: Victoria County History. 1908. Victoria County History 1. Victoria County History of Shropshire. Vol 1. p403-404. (03b) Monograph: Pevsner Nikolaus. 1958. Buildings of England (Shropshire). Buildings of England. p215. (03c) Monograph: Gough R. 1700. History of Myddle. (03d) Monograph: Pearson W. 1824. Views of the Antiquities of Salop. p83-85, illus. (03e) Article in serial: Eyton R W. 1887. The Castles of Shropshire. 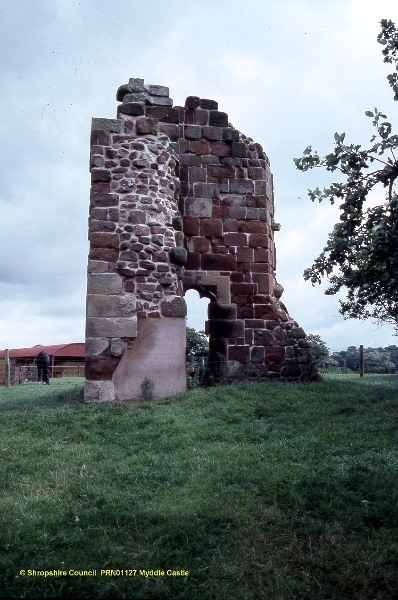 Trans Shropshire Archaeol Hist Soc. Ser 1, Vol X (=Vol 10). p30. (03f) Monograph: Stackhouse-Acton F (Mrs). 1865-1869. Castles and Old Mansions of Shropshire. (04) List of Buildings: Department of the Environment (DoE). 1986-Oct-29. 35th List of Buildings of Special Architectural or Historic Interest. Vol 1328-0. List volume. p72. (04a) Monograph: Hey David G. 1974. An English Rural Community : Myddle under the Tudors and Stuarts. p25-26 and Plate 6. (05) Excavation report: Connell J. 1966 ?. Excavations at Myddle Castle June 1966. (06) : Anon. Myddle Castle Excavations 1966 - Finds in Oswestry Library. (07) Site visit report: Burrow Ian. 1977-Feb-02. Visit Notes, 02/02/1977. (08) Photograph: Burrow Ian. 1977-Jan. Myddle Castle after Collapse in Dec 1976. Black and white. 35mm. (09) Article in serial: Woodward S A. 1912. Article in the Transactions of the Shropshire Archaeological and Historical Society. Trans Shropshire Archaeol Hist Soc. Ser 4, Vol II (=Vol 35). px-xi. (10) Scheduled Monument notification: Department of the Environment (DoE). 1973. Map of Scheduled area, 1973. (11) Photograph: Anon. 1986. Myddle Castle. Colour. (12) Photograph: Anon. 1977. Myddle Castle. Colour. (13) Photograph: Ryan Carole. 1983. Myddle Castle. Colour. (14) Photograph: Anon. 1986. Myddle Castle. Colour. (15) Correspondence: Various. 1981/ 1983. Correspondence, 1981-1983. (16) Correspondence: Various. 1980. Correspondence, 1980. (17) Correspondence: Various. 1977/ 1978. Correspondence, 1977-1978. (18) Correspondence: English Heritage. 1986. Correspondence, 1986. Shropshire County Council. (19) Photograph: Anon. Photos. Black and white. (20) Photograph: Anon. 1982-Sep. Myddle Castle. Black and white. 35mm. (21) Photograph: Anon. 1982-Feb. Myddle Castle. Black and white. 35mm. (22) TEXT: Horton Wendy B. 1990/ 1991. MPP Evaluation File. (23) Scheduled Monument notification: English Heritage. 2000. Scheduling Papers (Revised Scheduling, 07/07/2000). 32318. (24) Oblique aerial photograph: Musson Chris R. 2000-Mar-05. CPAT 00/MB/2041 to 2042 (2 photos). Black and White. Medium. (25) Archaeological fieldwork report: Reid Malcolm L. 2009. Myddle Castle, Shropshire. Scheduled Monument 32318: an evaluation and condition survey of part of the retaining wall of the moated island and adjoining buttress. (27) Monograph: Newman J & Pevsner N. 2006. Buildings of England: Shropshire. Buildings of England. P434. (28) Oblique aerial photograph: Shropshire Council. 2009-Apr-5. SA0908_239 to SA0908_243 (5 photos) Flight: 09_SA_08. Colour. Digital.